We’ve been selling this home cheese making kit at our Creamery in Ann Arbor for a while now, and folks have been, well, eating it up. Easy to follow instructions make it a great gift for kids, cheese lovers and families that cook together. 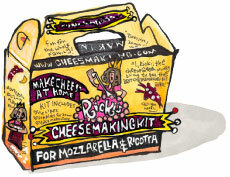 Every box comes with rennet and citric acid—enough for 30 batches of cheese—as well as instructions on how to make your own mozzarella or ricotta from scratch. All you need to provide is milk and salt. It takes less than an hour to turn the milk into cheese. My first attempt produced a fine looking mozzarella ball that I quickly turned into a salad with tomatoes, fresh basil and olive oil. Easy and delicious!